In the latest State of the Bay Report, the Chesapeake Bay Foundation gives the overall Chesapeake Bay a rating of C-. Unfortunately the Indian River doesn't score anywhere near that good. June 3rd is Clean the Bay Day and your opportunity to make a hands-on impact and help remove trash from around our waterways. 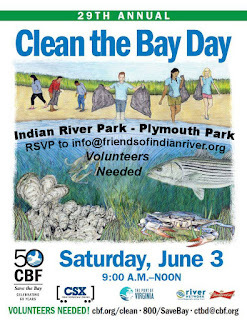 The Friends of Indian River is sponsoring cleanups at two sites: Indian River Park - this year in the stream bed below the Pony Baseball Field on Paramont; and at Plymouth Park on the west side of the river. We need your help. See below for more info and on how to RSVP. Our speaker this month on May 18th will be Laurie Fox who will discuss how to create a sustainable garden from beginning to end. Dr. Laurie Fox, Horticulture Associate Virginia Tech Hampton Roads Agricultural Research and Extension Center, will talk about sustainable gardening practices and the creation of a teaching garden at the research center. Learn about the design, planning, and installation of the garden from beginning to end and how you can apply these techniques to your backyard garden. We'll also have the latest area news. There will be light refreshments and door prizes. - New Location: Indian River Park at the Little League Ball Field on Military Hwy and Paramont Ave - 2305 Paramount Ave.
- Plymouth Community Park at 701 Pond Lane (two blocks north of Border Rd). 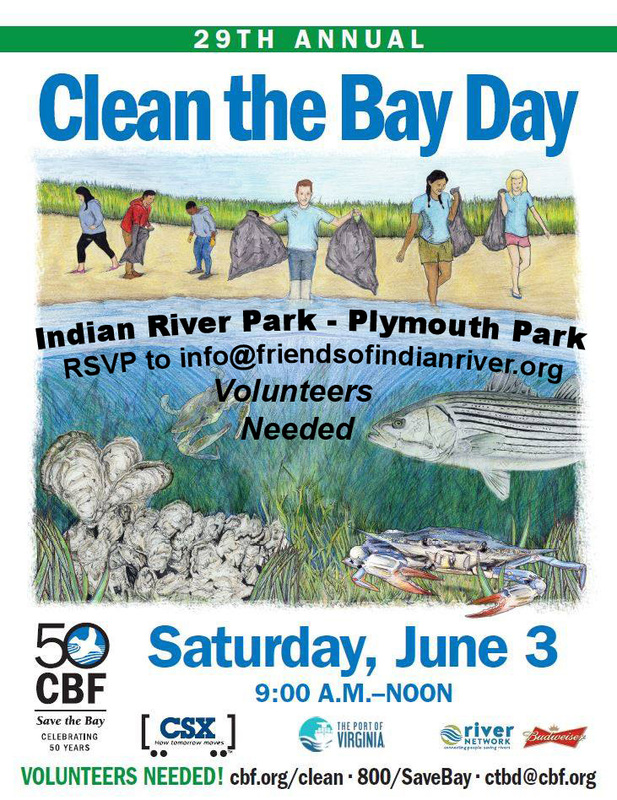 The Friends of Indian River's will be doing our big annual cleanup at two sites again this year. For the second year we'll be at Plymouth Community park on the west side of the river. And this year we're moving our Indian River Park cleanup to the Little League Ball on Military Hwy and Paramount Ave. The river flows just below the ball field and we've never done a cleanup here - and it needs one! We'll also send teams around to the Rokeby Playground and up along the Paramount Avenue side of the park. The city will provide garbage bags. We'll have water and snacks available. To help our planning, please RSVP to info@friendsofindianriver.org, tell us which site you want to support. (Last minute volunteers are still always welcome). Do you live along the tidal waterway? Well, you can help the river by becoming an Oyster Gardener. Help raise baby oysters off your shoreline, especially if you have a pier or other easy access to the water. And best of all, we will likely be able to keep many of the oysters raised on newly established reefs along the mouth of the Indian River. Chesapeake Bay Foundation led Training classes start in June. See Lynn in this 1 minute video explain how easy it is and learn how you can sign up.